Cablelay Matting is the flexible choice for under floor or basket tray-based cabling. A variety of thicknesses and widths are available depending on the type of solution that is required. For cabling that needs to run under the floor, 13mm and 25mm thicknesses are advisable, as these have been designed to be laid directly onto concrete, creating a dedicated route. The 25mm thickness is also ideal for communication rooms or pan areas, and is becoming increasingly popular. It offers the cables even more support and flood protection in densely populated areas. 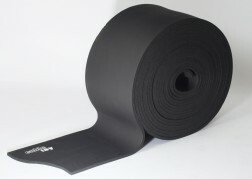 A lighter weight 6mm thickness is available for protecting cables in basket, cable trays and other containment where space is limited and pressure points and snagging are an issue. All types of Cablelay Matting are manufactured to the highest possible standard, the most popular type being Class 0 as this complies with UK Building Regulations, having the best fire performance results. Class 0 & LSF product conforms to British Building Regulations. Good fire performance result of BS Class 1 and a Halogen content of zero. "Great service, excellent products and knowledgeable staff make IMSIS a pleasure to deal with."